I ummed and ahhed about whether to call this a salad or a cocktail, and I’m still not convinced I went with the right choice. I think the fact that it’s about 60% greens (despite appearances) settled it. That, and a rare decision to distance myself from 70s dinner parties. Whatever you call it, it is still delicious. Tangy cocktail mixed with refreshingly cool cucumber and smooth, creamy avocado. I also found that serving it within the avocado skin was delightfully kitsch…only a little bit tacky. In a bowl combine ketchup and mayonnaise at around a 1:4 ratio. Grate in a generous amount of lemon zest and a squeeze of the juice, then mix in a teaspoon or so of paprika. The exact amount you make it down to you – the portion size you see filled one large avocado. Loosely chop your prawns and cube the red pepper and cucumber. Add to the mix and combine well. 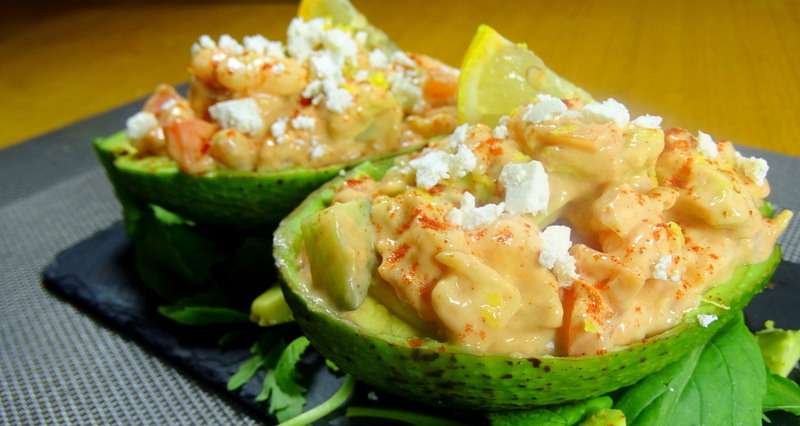 Slice your avocado into large chunks and add to the sauce, stirring gently so as to not mash it. 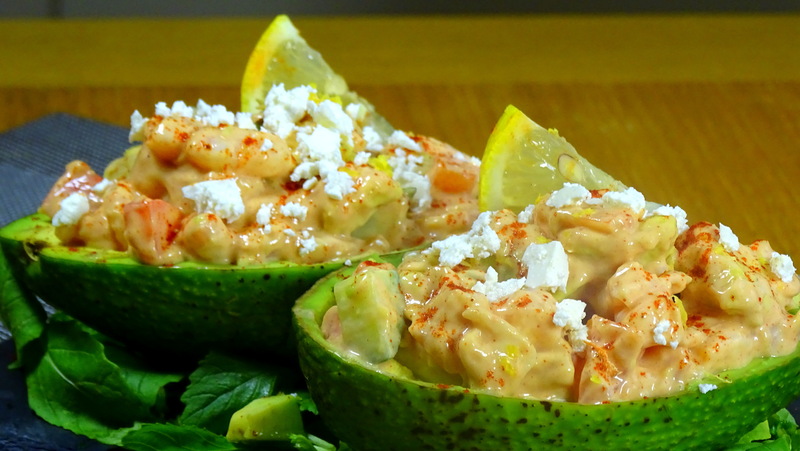 Serve inside the avocado skin with a sprinkling of feta, lemon zest and paprika. Posted in Fish, Guesscipes, One Pot, Sides and Snacks, Starters, UncategorizedTagged avocado, cocktail, fish, food, guesscipe, healthy, lemon, prawn, protein, recipe, salad, seafood, shellfish, shrimpBookmark the permalink.